This has been an excellent short-term play for us, so we want to congratulate anyone who was able to take advantage of our timely alerts. We included a mention of DRNE once again yesterday, after its inclusion in Friday’s report led us to the chance to make up to 24% in gains from .89-1.10. The stock responded with another nice performance, and registered higher lows and higher highs on the day. DRNE traded in a range from 1.09-1.30, a 19% intraday gain, and that high marked a 46% move up off of the low we observed when we tagged this play on Friday. DRIO was a play we were monitoring yesterday, as anyone who stopped by our blog at BlueHorseshoeStocks.com and took a look at our daily stock tracker would have noticed. The stock is coming across as a bottom-bouncer, which hit its 52-week lows in the nickel-range yesterday, and has already begun a healthy rebound, pushing its way back over .08. Significant volume is pouring through the stock for the first time in quite awhile, with yesterday’s session setting an all-time record, so DRIO will definitely be one we want to keep an eye on moving forward as it continues its recovery. DRIO also provides an excellent example of why its always a good idea to visit Blue Horseshoe daily even if you’ve already read our morning report in your inbox. Occasionally the content will be updated between the publishing of our morning reports and the opening bell, and visiting the site is the only way to catch those periodic and unannounced changes. We also have a Live Trading Chatroom that we participate in, the Legends of Wall Street, which you can check out free for a limited time only. CLICK HERE to go there, and use the password “bluehorseshoe” to enter. We expect the possible gains on those Calls to inflate even further as they draw nearer to their expiration if PBR can continue to follow its recent patterns. April 15th was the day we brought APP back into the conversation, because if you recall, this is one of our old-time favorites that we turn to around the same time every year for the predictability of its seasonal trading patterns. Right off the bat, APP did not disappoint- that day we saw a low of .47, and on Tuesday, the stock reached as high as .6895, marking a positive move on the chart of 47% in only a week. 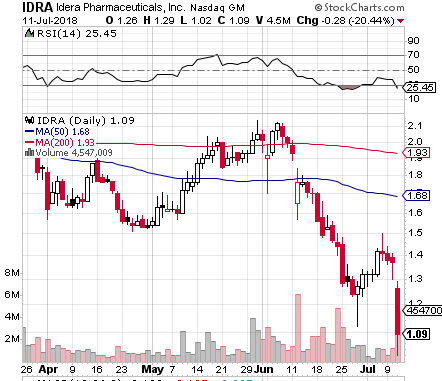 After the resistance at the 50DMA (.68) the next hurdles come at .80, .91, and 1.05. We’ll be continuously monitoring this play over the next several months as it tends to ramp up in price over the course of the summer heading into the height of the retail season. ZGNX is a stock that is catching our eye due to the current setup of the chart. If you track back to November, you can see that the stock ran from its current levels to more than 5.00 by February. We are looking at it now, as it is coming off of a recent bottom, and is gapping up this morning in pre-market activity (Currently trading over $3.00). The RSI is in a general uptrend, and a quick look at the MACD reveals an extremely bullish divergence on the heels of a recent cross. We just want to throw ZGNX up on our radars at this point, because a return to February highs would mean potential gains approaching 70% from current levels. First thing’s first; we want to congratulate anyone that caught AVOP off of yesterday’s Extended Watchlist. Marijuana-related news strikes again! The stock traded as low as .0006 early in the morning, and would go on to push as high as .0015 just prior to the close. That was good for an intraday run of 150% from this play on the heels of a press release stating that the company had been the subject of a friendly takeover by the Marijuana Incubator Group, which specializes in cultivation technology. We’ll definitely be following along with this story moving forward. Yesterday we saw PBR make its first big consolidation since we began tracking its recovery off of all-time lows, but not before gapping up to a new high. It provides a good lesson as to why it’s always a good idea to sell into a gap-up and lock in those profits on strength. Despite the dip, yesterday’s low of 13.70 is still significantly higher than its 11.25 price when we first came across the play on 03/21. We’d like to see support hold at or above that 13.70-mark, or risk seeing a more substantial pullback. Below that, the next level of support is the 200DMA at 13.47. Overall, PBR and its options chain has exceeded our expectations at every turn, and provided it holds the level of support we just mentioned, we still like the May $12, and April $14 Calls for longer-term chances, and the $13.50 and $14 Weekly Calls for possible short-term opportunities. It also marked the third consecutive session of the stock making both higher lows and higher highs, further confirming the uptrend off of its recent bottom. Speaking of marijuana-related plays, we will be re-alerting one of our old favorites tomorrow, be sure not to miss out on Thursday’s report hitting your inboxes between 9-9:30AM! This stock is primed with the potential for a serious move, so stay tuned! Moving forward, we’ll need to see support hold at or above .21 in order for us to remain interested in LWSP. Remember, per Tuesday’s PR, we’re waiting for an upcoming name and symbol change, expected to begin on May 16th. We’ll also be on the lookout for further updates from the company on its new direction in the e-cigarette and portable vaporizer market. For some of our newer readers, allow us to do a quick recap of how TTDZ has become one of 2014′s superstar picks for us. Beginning with our first alert on the stock on January 30th, we observed a low of .0012. and it has been pushing its upper boundaries ever since. By the time mid-March rolled around, the stock had punched above .015, gaining well over 1200% from our first call, but the party was just getting started. Flash forward to the present, and TTDZ has pressed its way all the way to an impressive high of .0385. Which means that in less than two months, we’ve seen a total increase of 3108% out of TTDZ. This is another play that recently transitioned into the cannabis sector that has applied for a name and symbol change, and we expect to have an update on that within the next few weeks. After picking up on PBR exactly two weeks ago today, we’ve seen some impressive trading action in that short time, especially with regard to the options chain. Besides coming across this stock shortly after it hit all-time lows, and witnessing the start of one heck of a recovery, we also received news this week of PBR’s boosted production numbers from February, which were significantly higher than those of previous months. Today we’ll be looking at the $13 and $13.50 Weekly Calls for possible intraday flip-opportunities. For those without the ability to stay glued to your screens all day, for longer-term possibilities, we’ve noted our interest in the May $12 Calls and the April $14 Calls. In the event that PBR fails to hold support at or above the 13-dollar mark, we would have to reassess our opinions.